Laurence A. Jacobs, M.D. provides In Vitro Fertilization (IVF), a treatment involving the harvesting of eggs and sperm to be joined outside of a woman's uterus. These embryos are then inserted within the uterus to increase the chances of a successful pregnancy. IVF circumvents a wide variety of infertility issues, such as blocked fallopian tubes. 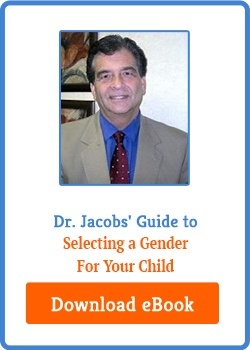 It also allows Dr. Jacobs to perform genetic diagnosis on each embryo. This treatment can be a viable option for patients who have tried less invasive treatments without success. The IVF process involves five basic steps. In the first of these, the female patient or egg donor will take oral contraceptives to suppress her natural hormonal cycle and menstrual cycle, allowing the ovaries to rest. In the next step, she will stop taking these contraceptives and begin taking fertility hormones (Gonadotropins). Dr. Jacobs retrieves these eggs and the embryologist fertilizes them in our IVF laboratory with careful precision. After some testing, healthy embryos are selected and transferred to the woman's uterus to promote conception. Using cryopreservation, Dr. Jacobs and the embryology staff can preserve unused eggs and embryos for future IVF cycles if necessary. We customize treatment plans according to the needs of each patient or couple. The cost of IVF varies according to these needs, including the number of cycles needed to become pregnant. During your consultation, our team will help you better understand the potential cost of IVF and any additional necessary treatments. To help you afford these costs, we provide a self-pay discount and the Attain Fertility™ IVF Program, as well as budget friendly fertility financing through CapexMD.com and HCSloans.com. We can help you determine which plan best suits your budget. After ovulation stimulation, our team will collect many viable eggs. Once fertilized, one or two of these resulting embryos will be inserted in the uterus. We utilize cryopreservation to save extra embryos or eggs for future IVF attempts should a patient's IVF cycle fail or to have extra for a future pregnancy. Thanks to advanced technology, this process is very successful in preserving eggs, and embryos for 5 years or more.